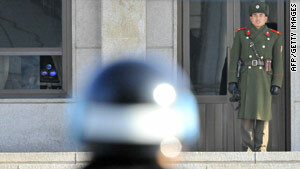 Talks between the two sides hit a wall after conservative South Korean President Lee Myung-bak took office. (CNN) -- North Korea will consider any pre-emptive strike that the South takes against its nuclear facilities as a declaration of war, its state media said Sunday. The North was responding to recent remarks by the South Korean defense minister. Defense Minister Kim Tae-young said last week that his country could launch a pre-emptive strike on Pyongyang's nuclear facilities if it confirmed that the communist nation was preparing a nuclear attack. The minister said that his country would have no choice but to strike first in such a situation. On Sunday, the North Korean military angrily lashed out, saying the "reckless" remarks were an indication that its neighbor was not serious about improving inter-Korean relations. "Our revolutionary armed forces will regard the scenario for 'pre-emptive strike' which the south Korean puppet authorities adopted as a 'state policy' as an open declaration of war," a North Korean military spokesman was quoted as saying by North Korea's official news agency. The two countries have technically remained in a state of war since the Korean War ended in 1953, although relations had warmed somewhat in the last few years. The Korean conflict ended in a truce, but no formal peace treaty was ever signed. But rapprochement talks between the two sides hit a wall after conservative South Korean President Lee Myung-bak took office in early 2008 with a tough stance toward the North. Tensions rose further after North Korea abandoned the six-party talks last April, declaring them "dead," in anger over international criticism of its nuclear and missile tests. The six-party talks, which bring together the U.S., North and South Korea, Japan, Russia and China, aim to negotiate a deal for North Korea to abandon its nuclear program in exchange for security guarantees and aid.